I have been sitting on my Kenya experience for awhile, probably good to share it with you all. 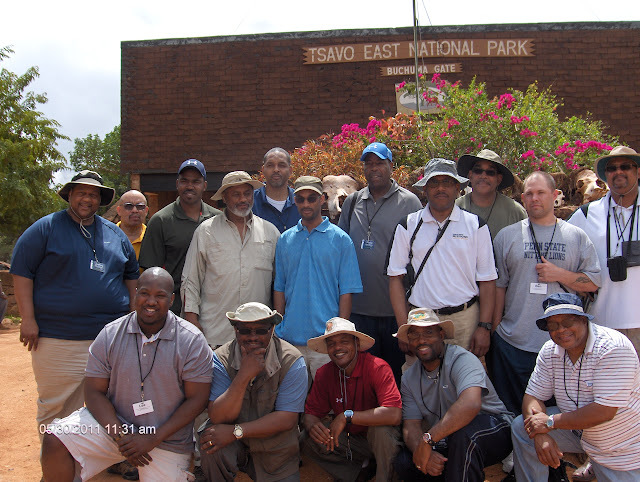 Here is my cohort from Biblical Seminary outside Tsavo National Park. I am right in the middle sporting the drifit baby blue shirt and shades. I love these guys, and there would have been no better team to organize and go to Kenya with than them. Many of us really bonded over the trip, even more than we had previously over the past 3 and a half years. Everywhere we went in Kenya we were greeted with “Welcome Home!”, which felt good. Many of us expressed how welcomed we felt while there, in many ways we were more accepted and appreciated there than our home country. The conflict of what it means to be African and American was something we rapped about after our return. That type of paradox is our history, our legacy. Our ancestors were unfree people in the land of the free. And then we come to Kenya, and felt so welcomed everywhere we went. Race is something we never avoided talking about in our group, we didn’t always agree on the solution (or even sometimes the problem), but it was all apart of our daily existence and could not be thrown in the closet and ignored. Here in Kenya, race came up more, but even more so colonization. I will have to share more of that in a later post. Stay tuned as I share my experience in Kenya.